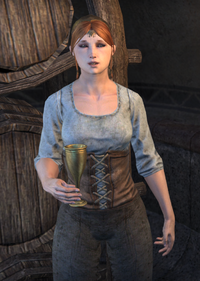 Herdora is a Nord brewer who runs the Waistworks Eating House in the Brewers and Fishmongers Hall of the Canton of St. Olms the Just in Vivec City. If engaged in conversation, she will say, "I learned my craft by studying at Voljar's Meadery and the Fire-Hearth Brewery. You won't find a better beverage in all of Vvardenfell. ", "How do I remain sane in this land of nightmare creatures? That's easy. I drink! I recommend a particularly strong brew if you're new to the region. ", or "If you're looking for something to put a sparkle in your eye, try some of my choice stock. Just don't drink it too close to an open flame." This page was last modified on 7 January 2018, at 19:55.